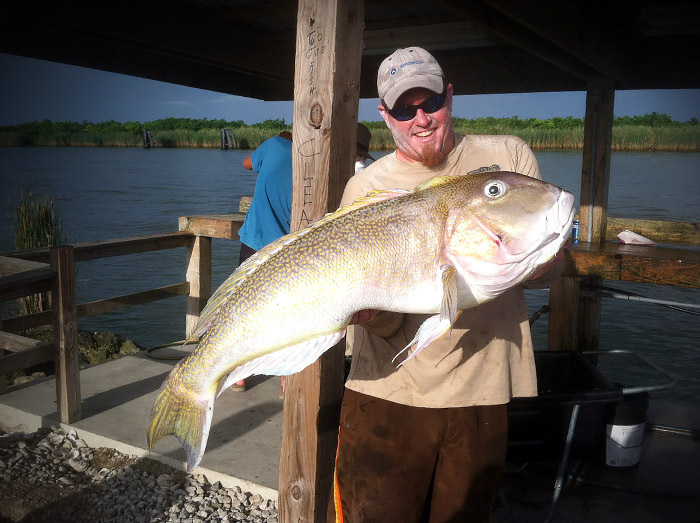 Tilefish, also known as Golden Tilefish or Blanquillo, are odd and interesting creatures, found at great depths in the Gulf of Mexico off the coast of Louisiana. At MGFC, we encounter tilefish in 500 to 1,000 feet of water. Our most common method of catching this species is to use an electric rig to pull the critters up from the depths. Do you want to experience this unique style of fishing? They feed in daylight, and like to stay in waters that are between 47 to about 53°F. It feeds most heavily between late morning and early afternoon, and moves slowly along the bottom in subdued light around structures such as oil rigs and other platforms. The best months for tilefish are in the winter. Electric reels and the strongest rods, weighted with lead weights, are the most common approach. “It used to be we would always put the rod in a holder, but with lighter lines and lighter weights, we sometimes have anglers hand hold the electric reels like they’re grouper fishing,” says Capt. Kevin Beach, on the Pale Horse. The great thing about catching tilefish is that it is a unique experience, they taste great, and there is just something wild and primitive about the way they look. Tilefish take bait instantly when it’s feeding time, and will fight for about the first 100 feet or so. As they ascend and the water pressure changes, they succumb to the changes in pressure and settle calmly. There is no such thing as throwing back a tilefish; 1. they taste fantastic, 2. the mortality rate from the bottom at great depths is 100 percent. Another fish often found at these great depths, is the snowy grouper. Also a great tasting delicacy, the snowy grouper lives longer than a tilefish, and grows to higher weights. While most tilefish top out at 40 or so pounds, snowy grouper can reach up to 70 pounds. Book a trip with MGFC now! Whether you’ve experienced a charter trip going for tilefish , or if this is your first time, give us a call. Let’s catch some tilefish with MGFC! Get the latest & greatest from The Mexican Gulf Fishing Company. Enter your email address to subscribe to the MGFC Newsletter. Get the latest & greatest from The Mexican Gulf Fishing Company. Mexican Gulf Fishing Company is based in Venice, LA and operates in the Northern Gulf of Mexico. We run Freeman Boatworks catamarans, for offshore fishing, and BlueWave bay boats for inshore fishing … all with the latest gear and technology. MGFC is able to provide you with world class fishing year-round. Book a charter with MGFC, and we promise you the trip of a lifetime. Captains: Billy, Kevin, Jordan, Colin, Zach, Richard, Wade, and Justin. Build your dream trip with MGFC! Our Captains are: Kevin Beach, Billy Wells, Jordan Ellis, Colin Byrd, Zach Lewis, Wade Wells, Justin Fayard, Larry Aleman, Chad Reinhardt, Paul Miller, and Richard Draper. All you need to book a trip is a $300 deposit. Select your day(s), and book online. Fees start at $1,800 + fuel / per day, per boat. Price includes all bait, ice, tackle, and fish cleaning. Each boat holds 6 passengers. Fuel averages 225-250 gallons per trip. Trip times: Average trip is 9-10 hours (dock-to-dock). Maximum is 12 hours.